Why should we waste our time in traffic jams, when we can choose micromobility? This time Ignas Survila, a Co-Founder and CEO of Lithuanian startup “Unicorn scooters” explains the mission of electric scooters startup and huge benefit of nowadays micromobility. Check our weekly article “Startup Of the Week” and find out more! So what is Unicorn Scooters? How does it work? The Unicorn Scooters is a Lithuanian startup with a mission to make a radical change to the ridiculous amount of urban pollution, traffic jams and the old-school approach towards mobility in the cities around the world. 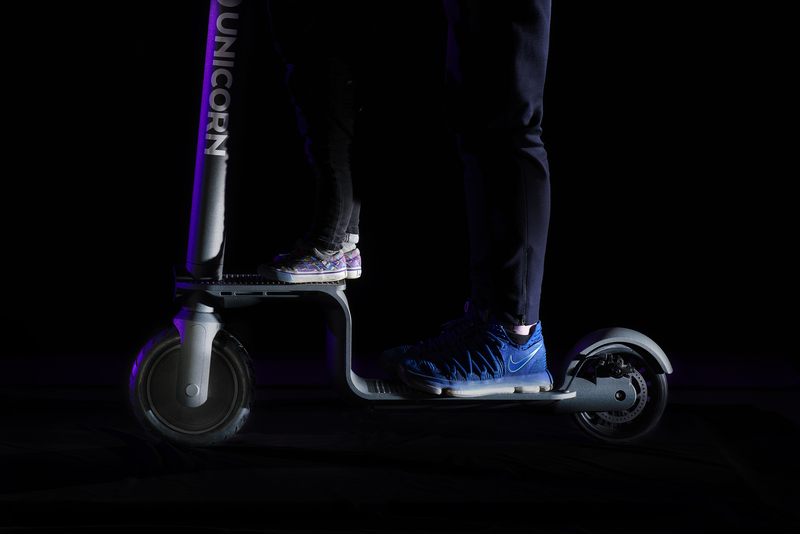 Unicorn Scooters are the electric kick scooters designed exceptionally for sharing. Our scooter is robust, durable, has just the right functionality and outstanding design. Unicorn scooters can be used for sharing in the cities or for business purposes, e.g. for moving inside the factories, exhibition centres, airports, etc. The best part is that Unicorn Scooters have no direct competition. We have a premium product. Unlike most of the scooters used in the scooters sharing market, Unicorn is created exceptionally for sharing. Our scooter has a massive battery with a range of 80 km per charge. It is 2.5 times more than our competitors. Most of the scooters are thrown away after 28 days. Our scooter is more than two or three times durable. Moreover, it has a swappable battery which helps to reduce the maintenance costs for the sharing service providers. Also, an outstanding design of the Unicorn scooter is what makes it unique. Together with our amazing team at the Unicorn Scooters, we have rejected all the unnecessary parts and functions like folding mechanism, etc. in order to reduce the additional maintenance costs of the scooter and create a functional and smart design. The signature step distinguishes Unicorn from the others and also serves as a platform for carrying a grocery bag, cargo or even a kid. Everything in the Unicorn has a purpose. First of all, we are big fans of micromobility concept in general. Micromobility just makes sense from any point of view: scooters and bikes (and soon there will be even more different vehicles) are easy to use, fun to ride (yes, it’s very important), widely affordable, fast enough to reach a destination quicker than by foot, safe to ride, easy to park and sustainable. Micromobility plays an extremely important role in reducing air pollution in the cities. So how can you not love it? Do you know that 60% of all the trips for less than 5 miles in the US are made with scooters and bicycles? Scooter sharing businesses are getting more and more popular around the globe. However, the business is very problematic! Today scooter sharing service providers are facing negative unit economics and the businesses don’t work. It’s because of the short lifespan of the vehicles. According to our research, we made before creating the Unicorn, most of the electric kick scooters used in the scooter sharing market were designed for personal use and lasted only 28 days. It doesn’t make any sense and is not sustainable. So, we have recreated something that everyone already knows and designed an e-scooter exceptionally for sharing. We have launched the idea and the first prototype of Unicorn scooter in December 2018. – In B2B case we are going to sell our scooters and charging station network to scooter sharing service providers, B2B businesses or Municipalities in the US and Central Europe. – In B2C case we will launch our own pilot scooter sharing platform on our own or with the partners in Vilnius this year. Starting from 2020 we are going to expand to other small geographical regions in Scandinavia and Northern Europe. Generally speaking, there’s no need to rush in defining the customers who will be using e-scooters. The best part of the micromobility is that these vehicles can be used by anyone able to ride. For example, one of the most interesting facts, according to the statistics, is that women and older people find electric scooters more attractive transportation than bicycles because e-scooters are more convenient and easier to use. Manufacturing is the main challenge for us today. In a process of manufacturing a sustainable micromobility vehicle, it’s extremely important to manage how to keep the whole process as sustainable as possible. Therefore, choosing partners and manufacturers was one of the biggest challenges for us. Even though the manufacturing in China was much cheaper we have chosen strong partners in Europe that will play an important role in helping us to reduce the impact as much as possible. But, of course, this is only one part of the process. There will be much more challenges that we will need to tackle. Also, we are working on the improvements of our scooter almost every day because it’s extremely important for us to have a unique and nearly perfect shared scooter that will be absolutely comfortable and easy to use for any rider. We are closing our first seed round very soon. So, we will be able to start mass production and accelerate our business. What we can reveal right now is that it will be a really big round compared with other hardware-based startups in Lithuania that were funded in the same stage as are we. We are the Co-Founders together with my friend, an engineer Jevgenijus Piurko. We both have around 4 years of experience in Citybirds where we were designing and manufacturing the kick scooters from a scratch. City birds products have been awarded 13 worldwide known design awards including two RED DOTs and three A’Design Awards. I have an MBA and a Bachelor’s in Industrial design from the Vilnius Academy of Arts. Barbora Gedvilaite is the CMO at the Unicorn Scooters. She is a communication and marketing professional with 12 years of experience in this field. We also have a team of external advisers who are helping us out in finance, legal, sales and communication. In order to accelerate, avoid mistakes, evaluate the possible risks and reach the main goals as fast and efficient as possible, we have established the Advisory Board of the professionals. Right now we are searching for two manufacturing managers and one engineer. Thus, if you (the reader) are the one we are looking for, give us a shout. We are not generating any income yet. But we already have the letters of intents signed with various potential customers around the world for 24 000 scooters. It shows a massive demand for such vehicles. Speaking about long-term vision, we know for sure, that we are not going to be a one-product company. Even though we are going to sell the scooters during the first year, we are eager to make shortcuts anywhere we can. So, while we will be doing what we know best – manufacturing the scooters – at the same time we will be cooperating with other professionals, who will help us to accelerate in other areas as fast as possible. Only after careful consideration, setting the strict terms for manufacturing and analysing the data we will collect during the first year, we will enter our next stage – develop our own sharing system. We are already developing our own API that will allow businesses to purchase a full package of services for their own scooter sharing system. We believe that micromobility is going to work smoothly only if the whole system works impeccably. Mobility eventually is going to become not only a tool but a platform combining all the means of urban mobility. Even though the market is booming and the biggest players are raising millions, there’s still a place for a real leader here. For the Apple of the micromobility which we are eager to become one day.